I am a total Adventure Time fan girl. The origin stories of each character really draw me in, I easily relate to the characters and it is so kawaii. M is a lot like Marceline mixed with a bit of Bubblegum and I am a lot like Bubblegum with a large dose of LSP. The Princess Day Episode gives me total flashbacks of our antics. The clip below catches the moment when all of the shenanigans start. You can watch the full version, Season 6 Episode 14, on Hulu. I can totally relate to Bubblegum's determination to finish her crossword. For me it would probably be a book, notebook or cellphone article. It's serious business, obviously. I don't remember which episode this gif is from but it is so us. 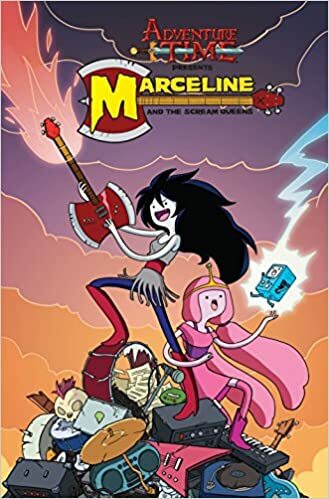 Apparently there is even a comic mini series starring Marceline and Bubblegum called Marceline and the Scream Queens. Totally on my Wish List now. I shall leave you all with Catventure Time because it is just the cutest. I totally want a Catventure Time shirt. Graphic tees forever! LSP is my favorite here, so grumpy. Almost makes me want a bunch of fluffy cats so I can dress them up like this. Over it though. I like leather furniture too much, I think it's cruel to declaw, and I despise the fact that they eat birds. Total dog person now, especially corgis! I was totally fascinated by the whole cats vs cucumbers trend though. So weird.